This Flora ProActiv spread contains the natural power of added plant sterols that help filter cholesterol from the body. A daily consumption of 1.5 to 2.4g plant sterol can lower cholesterol by 7 – 10% in 2 – 3 weeks as part of a healthy diet and lifestyle with sufficient fruit and vegetables (Plant sterols have been shown to lower blood cholesterol). ProActiv Buttery tastes indulgent and is great in sandwiches and melted over baked potatoes to help lower cholesterol. 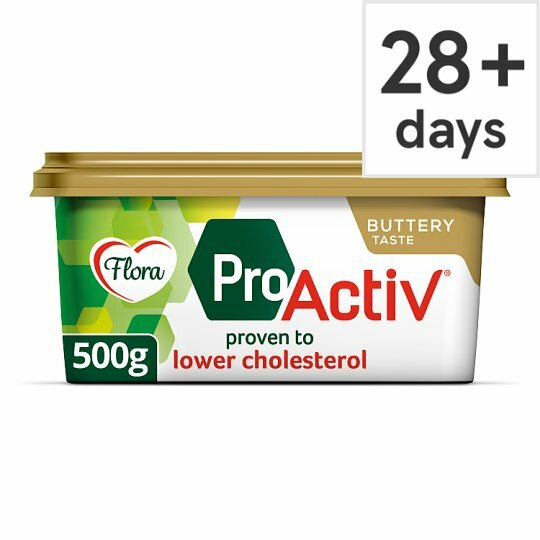 3 servings-a-day of Spread or Milk (1 serving = 2 teaspoons Flora ProActiv spread or 250ml Flora ProActiv Milk) or 1 of our Flora ProActiv Mini Yoghurt Drinks. High cholesterol is a major risk factor in the development of coronary heart disease. As heart disease has multiple risk factors, you may need to improve more than one to reduce your overall risk. This product is not intended for people who do not need to control their blood cholesterol level. Margarines contain 80% fat, whereas our Flora Buttery spread contains less than 80% fat and are therefore classified as vegetable fat spreads. Other spreads in the Flora ProActiv range include our Light low fat spread and Olive spread with olive oil which help to lower cholesterol. Suitable for spreading. Not suitable for cooking, baking and freezing.